Have an upcoming Rewards day or School fete? Browse through our equipment and get the best package for your event. Corporate,Council Events or Festivals – We have the experience and the amusements to help you out host a successful event! Do your little ones LOVE bouncy castles as much as ours do? Birthdays or backyard parties, host a successful event with us! If you live in rural or regional WA, we can cater for your event with our regional amusement hire packages. 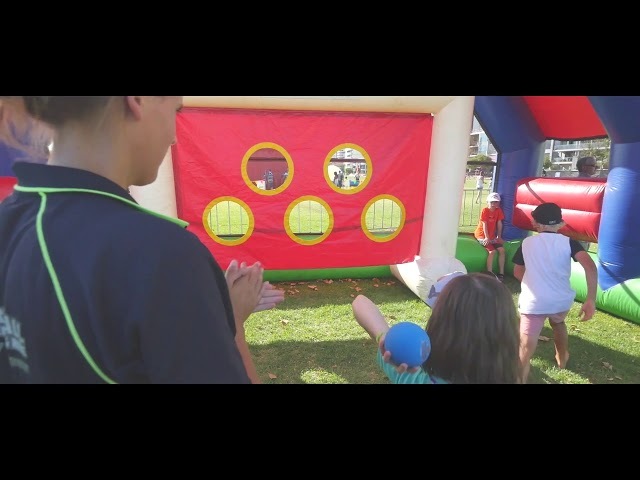 Monsterball Amusements are Perth’s premier inflatable amusement equipment and bouncy castle hire company delivering hours of fun and physical activity for adults and children alike in Perth and across the entire state of all Western Australia from Broome to Albany. Choose from WA’s widest range of party hire equipment including themed bouncy castles, water slides, dunk tanks, climbing walls and a wide range of obstacle courses for the ultimate in extreme fun. Whether you’re celebrating a birthday, organising a corporate function or school fair, arranging entertainment for a community event, or simply marking the start of summer with water-themed attractions, you’ll find the best inflatable and party equipment for rent at Monsterball Amusements. We’re covered by public liability insurance up to $20M. Huge range of obstacle courses, for the young and old! We got you covered with the best sport inflatables available! There’s free delivery and set up within 30km radius from Fremantle and we can also suggest great party ideas and ways to incorporate our equipment into your event. Ask us for advice and tips on setting up and running a successful event and what you’ll need for our inflatable or party equipment, such as access to power and water. We regularly add new equipment, so make sure to check back for the newest themed bouncy castles, obstacle courses and more. Country residents don’t miss out. We also service rural and regional Western Australia, travelling between Broome in the north, Albany in the south and east to Kalgoorlie. Minimum package hire conditions apply for regional customers, so please contact us for a quote if you’re planning an event outside of Perth. Please note that all our equipment is fully WORKSAFE registered and our Public Liability Insurance is up to $20M.